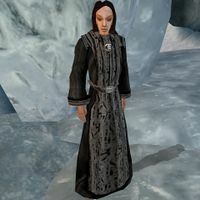 Ettiene of Glenmoril Wyrd is an Imperial witch located inside the Gloomy Cave. Ettiene and her two sisters Isobel and Fallaise have traveled to Solstheim to help those unfortunate infested by a certain disease. 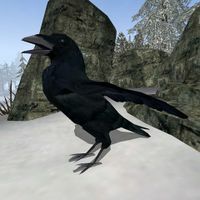 When you first meet Ettiene at the Altar of Thrond, she is masked as a raven, offering help. Ettiene's raven-form appears only during cut-scenes, and she cannot actually attack or be attacked in this form. There are three versions of Ettiene that appear at different times. The glenmoril_witch_altar version appears at the Altar of Thrond until stage 30 of the related quest is complete. The glenmoril_witch_altar_2 version appears during the ritual itself, and glenmoril_witch_cave appears with her sisters in Gloomy Cave. Ettiene makes a reappearance in the Skyrim Dragonborn add-on as a hagraven, along with her sisters.